In a proton, quarks with spin pointed in the up direction (red and blue) tend to gather in the left half of the proton as seen by the incoming electron, whereas down-spinning quarks (green) tended to gather in the right half of the proton. A successful measurement of the distribution of quarks that make up protons conducted at DOE's Jefferson Lab has found that a quark's spin can predict its general location inside the proton. Quarks with spin pointed in the up direction will congregate in the left half of the proton, while down-spinning quarks hang out on the right. The research also confirms that scientists are on track to the first-ever three-dimensional inside view of the proton. The proton lies at the heart of every atom that builds our visible universe, yet scientists are still struggling to obtain a detailed picture of how it is composed of its primary building blocks: quarks and gluons. Too small to see with ordinary microscopes, protons and their quarks and gluons are instead illuminated by particle accelerators. At Jefferson Lab, the CEBAF accelerator directs a stream of electrons into protons, and huge detectors then collect information about how the particles interact. According to Harut Avakian, a Jefferson Lab staff scientist, these observations have so far revealed important basic information on the proton's structure, such as the number of quarks and their momentum distribution. This information comes from scattering experiments that detect only whether a quark was hit but do not measure the particles produced from interacting quarks. "If you sum the momenta of those quarks, it can be compared to the momentum of the proton. What scientists were doing these last 40 years, they were investigating the momentum distribution of quarks along the direction in which the electron looks at it – a one-dimensional picture of the proton," he explains. Now, he and his colleagues have used a new experimental method that can potentially produce a full three-dimensional view of the proton. The new method measures neutral pions, made of one quark and one antiquark, as they are produced in collisions of fast-moving electrons with protons. In addition to the momentum distribution, this method allows one to infer the spatial position of the quark as it was hit – how far the quarks are away from the proton's center and if their spins are pointing in the up or down direction. It projects a spatial image of the proton's quark content in the plane transverse to the electron beam. "It is the transverse space distribution. And so the one-dimensional picture is extended to a three-dimensional image that allows us to understand how those little quarks are distributed in the space. That is, we learn at the same time how far they are from the center and what are their momenta," Avakian says. To make the measurement, the researchers needed to thwhack a number of quarks with electrons just hard enough for the quarks to absorb energy from the electrons and then give it away again, without ever breaking up the protons. "This is the method of exclusive electron scattering, where you don't destroy the proton, you just touch a single quark," explains JLab Theorist Christian Weiss. "The electron hits the quark, and this quark shakes off a pion. The quark returns to the proton, and the proton remains intact and recoils. You measure the pion and the recoiling proton in addition to the scattered electron. This method gives you much more control than traditional inclusive scattering, where you do not detect the produced particles." However, the experimental data alone isn't enough. To extract detailed information, the experimenters must plug their data into a complicated theory expressed as a set of mathematical expressions, called generalized parton distributions. The expressions combine to provide detailed information on how both the quarks and gluons, together called partons, behave inside the proton. It's thought that these generalized parton distributions, along with other information, will provide the first-ever three-dimensional view of the proton's structure. "It's like you have some mosaic. These are parts of your mosaic. To get the picture, you need all these pieces to put together," Avakian says. The CLAS collaboration conducted the experiment in Jefferson Lab's Experimental Hall B in the spring of 2005. The first result was published last fall in the journal Physical Review Letters. They found that it was possible to successfully carry out an experiment using this tricky method of probing the proton without destroying it to get the data they need for the generalized parton distributions. They plugged the data into two theoretical models of generalized parton distributions that simulate the spin and location of the quarks and allow one to recover a genuine three-dimensional image of the proton. "The position of the quark depends on how its spin is pointing or on its momentum. The spin of the quark affects the probability to find the quark in a certain point in space," Avakian explains. In particular, they found evidence that transversely spinning quarks with their spin pointed in the up direction tended to gather in the left half of the proton as seen by the incoming electron, whereas transversely spinning quarks with their spin pointed in the down direction tended to gather in the right half of the proton. He says the result confirms that protons are complex systems, with a rich internal structure and sophisticated dynamics, referred to as Quantum Chromodynamics. "The quarks are not just distributed in momentum in one direction. They have momenta, positions, and everything is moving around. As of now, we don't understand very well the dynamics, such as how this spin is correlated with the position and the momentum. That's what we are trying to study - the interplay of the quark's internal motion and their spin with their spatial position in the system," Avakian says. In the meantime, Avakian and Weiss both agree that this successful experiment has broader implications. It has proven that the exclusive electron scattering method can be used to begin filling in the information needed for generalized parton distributions toward obtaining that three-dimensional view of the proton. Physicists worldwide are working toward that common goal, and the technique pioneered here can also be applied at much higher energies, beginning with Jefferson Lab's CEBAF accelerator at 12 GeV and later with a future Electron-Ion Collider. Similar measurements can also be performed in scattering experiments with proton beams at facilities such as GSI in Germany and at Japan's High Energy Accelerator Research Organization, known as KEK. "The physics community consider this as a first-priority task: To understand the 3D structure of the nucleon," Avakian says. The knot models of electron and proton enable to compute the charge/mass of elementary particles quite simply and exactly by entropic balance. But these insights are ignored with mainstream physics in the same way, like the cold fusion/ZPE/antigravity machines, despite/just because they undeniably work. And I'm not talking about forty years old Heim's theory. We can guess the mass of protons with lattice calculations with 5% precision, but it needs huge computers and complex QCD = it's a job and salary generator for many people involved. The contemporary physicists don't seek the simple and elegant solutions of problem: they do seek stable jobs. We can see it everywhere. This may seem like a silly question, but if I were to be viewing that depicted proton from its other side (ie 'back'), I would be seeing two quarks with a downward spin and one with an upward spin instead. How do they know which side they are viewing the proton from, and how did they figure out which bit to call the 'front', so that they could say that a proton has two-up and one-down quarks? After all, they do seem to have worked out the model in bits and pieces at a time, rather than created a complete theory in one go. That does seem to imply a higher probability of initial misinterpretation. I thought that spin up quarks were kept in the right half of the proton. If they are kept in the left half, then where does the proton keep it's car keys? The other question that comes to mind is, what shape do quarks (and protons) really have? If quarks are actual spherical shaped balls, then with 'only' three of them, you can ONLY arrange them in a flat, 2D-like triangular arrangement. So there would be an awful lot of space in the proton,(perhaps) filled with something else, or you would have one very pancakey proton. And that would not make for good movement, let alone spin. (I'm treating spin as literal here, just like in the pic). I'd make the same argument for the shape of the quarks themselves, or else the 'spin picture' wouldn't work either. See the first comment in this thread - such a questions are already answered. spin is an observable which is always either up or down w.r.t. whatever spin direction the detector was set up to measure. the shape is more of a probability distribution. think of electron orbitals. @DarkHorse66: You asked, I replied - that's all. I did spend the years with analysis of the best ideas on this field, not you. So until you have no better answer or counterargument, then you're expected to refrain of OT comments here, because you've no value to add. Refraining from OT comments...You might like to be mindful of that yourself. An answer needs to be appropriate for the question. Yours wasn't. It was about pushing your pet theory, that no one wants to hear anymore. It had no value to add. At all. An answer needs to be appropriate for the question. Yours wasn't. You didn't prove, my answer wasn't appropriate. For example, my illustration explains, why quarks are of 2/3 charge and why they cannot exist at free state. You didn't prove, my answer wasn't. For example, my model explains, why quarks are of 2/3 charge. You also never give a proper, scientific explanation, or any maths foundations. you just spruik. So, why should I even THINK about trusting or believing your 'theory'? And, as far as this site is concerned; AWT IS OT. Whether you admit it or not. Your question was about actual shape of quarks and proton. The explanation of fractional charge of quarks is just a free bonus of my answer. Your AWT explanations can't be that trustworthy. It's supported with calculations of proton/neutron mass based on the same geometry. It's supported with http://quantoken....tar.html of proton/neutron mass based on the same geometry. I call you out on bad grammar. Technically correct. I'd just add that at quantum scales the notion of spin is slightly different than our everyday concept of spin. Quarks probably don't have a spatial extent in the usual sense (they are modelled as point-like). Especially when you get to the point of spin superpositions the analogy becomes iffy. Yeh what's with this measuring both the momentum and radial distance from "centre of the proton" (lol). Where is Heisenberg on this? Somehow we're meant to believe that all of a sudden they can measure subnucleic particles position's and momenta AND also that the sensitivity was good enough with low enough approximation margins to determine where the centre of the proton is. Iffy is right. They are measuring the distributions, not those values themselves. From the distribution you can see that the maxima are off-center relative to the maximum of the proton position distribution. This supports Oakley's description of the proton as a single EM wave circulating as an involute helical toroid where the rotation direction on opposite sides of the helix is always opposite. The mass energy x,y,z distribution (with 'A' the fine structure const. ~1/137) is mc^2. (A^-2/3.A^-2/3.A^1/3), and mc^2 ~ 6.8MeV. The EM wave E field is directed outward from the helical boundary and in the near field appears as partial charges. 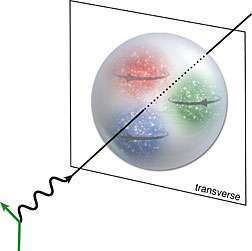 The single wave explains quark confinement. The far field mass is nominally m/A. See Oakley's e-book on the web 'Rethinking Physics'. The electron is also a toroid of nominal mass 2m.A^2/3. Remember Occams razor! The same value of m for each particle means the value of G is the same for both. Evidently the proton structure is really simple as is the electron, an evolute toroid. Just what might be expected at a fundamental scale. So there are no individual quarks, and no gluons. Actually - the picture only shows up or down spin if you turn your head 90 degrees to the right. Or is it these new glasses I got?